First things first, quick apologies for missing last week. I was on the road in Arizona last Tuesday through Thursday and that kept me from being able to think about anything other than getting from point A to B. I did get a chance to stop by a local comic shop in Phoenix though (the marvelous All About Books And Comics), where I picked up a few new floppies - the marvelous first issue of Michael Cray and the always great Mister Miracle. I also nabbed a couple of bagged runs, in this case the entirety of Wolfman and Colan's original Night Force (just before DC puts out the nice hardcover...go figure), and the first full mini of Nathaniel Dusk. I was on a real Colan kick I guess. Today, I should be getting my Justice League International omnibus in the mail, and I just got my Bronze Age Swamp Thing one as well. So I'm all set for print reading for the foreseeable future, that's for sure. Will that stop me though, really? 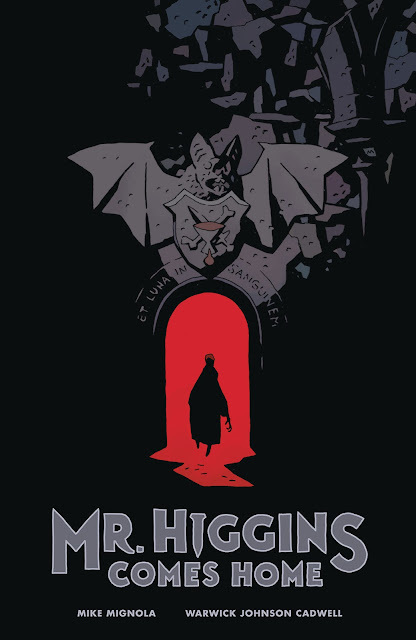 Mr. Higgins Comes Home h/c - Mike Mignola writes/Warwick Jackson Caldwell draws this send-up of vampire tales. 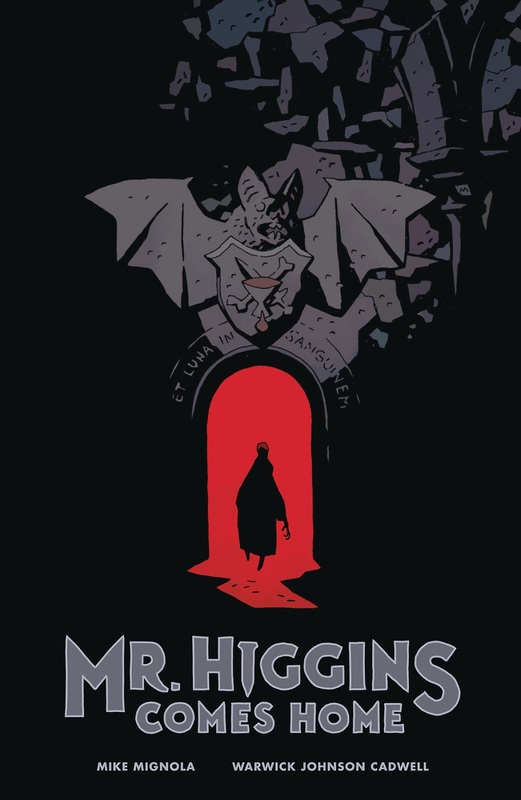 I'm excited about this because it's been a while since I've seen Mignola solo-script something outside of his Hellboy milieu, and given his predilection for gothic horror, this looks to be a lot of fun. Sherlock Frankenstein and the Legion of Evil #1 - the first Black Hammer spin-off from Jeff Lemire and artist David Rubin, focusing on the villains of that other great current Dark Horse-borne comics universe. Rubin has done some nice fill-ins on the main title recently, so I'm really primed for this new foray into another viewpoint on this world. Aquaman #29 - As always, I think Dan Abnett's Aquaman is one of the most genuinely enjoyable books DC has in their main line, and this current arc with art by Stjepan Sejic has elevated the title's mysticism and adventure. Plus Aquaman has a beard again and long hair. Just in time. Grayson: The Superspy Omnibus - Your expensive collection of the week. Here's the title that foisted Tom King onto the world, and in a pretty glorious fashion. For a while there, I thought this was the most fun comic DC had, especially during the end of the New 52/DC You era when readers were much more sparse. This is a collection of the entire thing. The King issues are largely better than the Seeley ones, and they're both better than the two writers that take over for the rest. But those first 19 issues are pretty rock solid, modern day DC thrill-rides. Sebastian O/The Mystery Play h/c- the "your mileage may vary" Grant Morrison collection is out this week. And as a completest, I think I must have this, as it will sit well next to my Kill Your Boyfriend/Vinamarama h/c. But it's also worth noting that I'm much more mixed on both of these stories. Don't ask me, I know some folks that love them. The Wild Storm tp vol 1 - I bet this series reads a lot better in a collected form. That cover is really cool. And after reading Michael Cray, I'm suddenly a lot more into this as its more subdued main title - which is unusual. Kid Lobotomy #1 - the first title in the Shelly Bond curated Black Crown line, which was the talk of SDCC this year. This being a collaboration between Peter Milligan and Tess Fowler has my attention, especially to see how the central concept of the line is shared between the titles. My first IDW title in quite some time. Kill or Be Killed #13 - I'm six issues behind, I'd still buy it. It's Brubaker/Phillips. Thor #700 - After last week's big "Marvel is teaming up with a defense contractor" hullabaloo, I've basically sworn off their publishing line - but this is surely some big culmination of Aaron and Dauterman's run. You might want it, I'm sure it'll be especially pretty. Now #1 - Fantagraphics is basically picking up where the admirable, but never could quite find an audience, Island left off. They've created their own anthology ongoing with works this issue from Eleanor Davis, Dash Shaw, Sammy Harkham and more. This'll surely be more my speed.